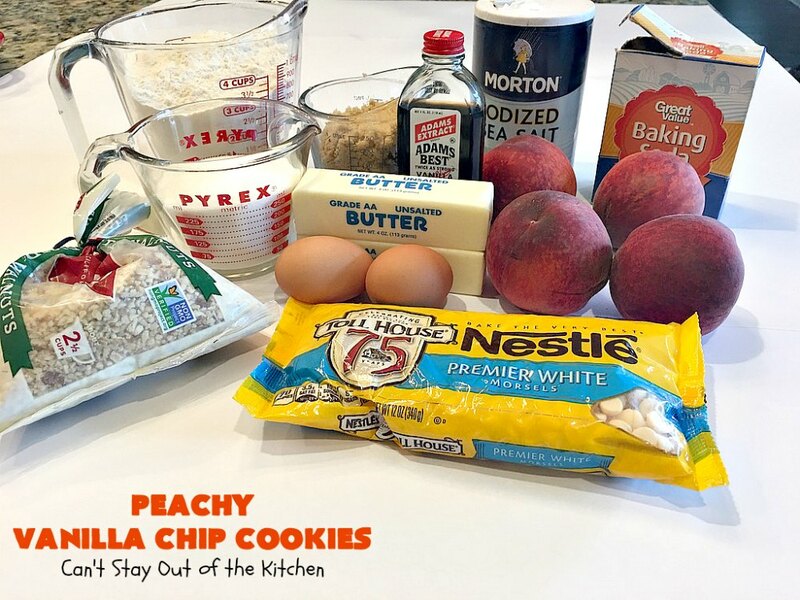 Have I got a cookie for you–Peachy Vanilla Chip Cookies! These ones are loaded with peaches, walnuts and vanilla chips which make them super sweet, crunchy and chewy at the same time. I based Peachy Vanilla Chip Cookies off my niece, Heather’s, Best Chocolate Chip Cookies, and again I found a winner. 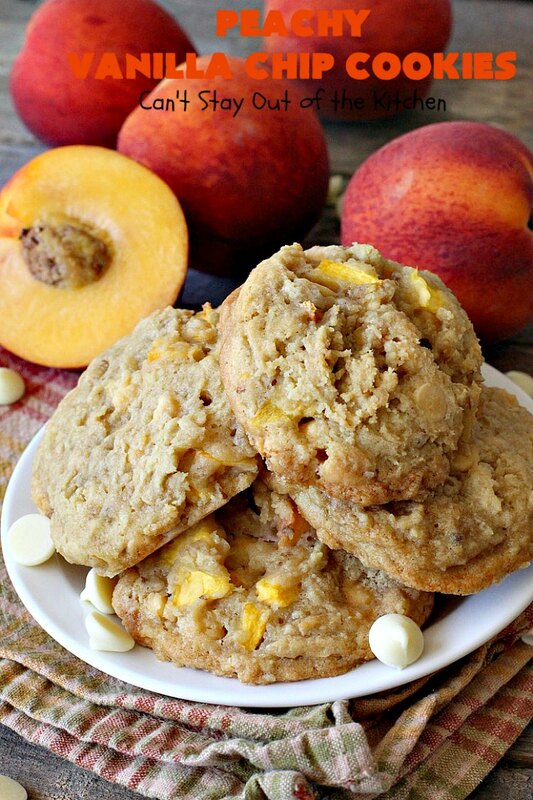 Just like chocolate chips, butterscotch chips, white chocolate chips, and cinnamon chips work well with peaches, so do vanilla chips. In fact, these turned out so well, I was ready to turn around and make a second batch immediately! Vanilla chips are one of my favorite chips to include in Christmas cookie baking. While I use plenty of chocolate chips, peanut butter chips and all the other flavors, one of my favorites is vanilla chips. I suppose that’s because I love vanilla and I love sugar, and vanilla chips are loaded with both! 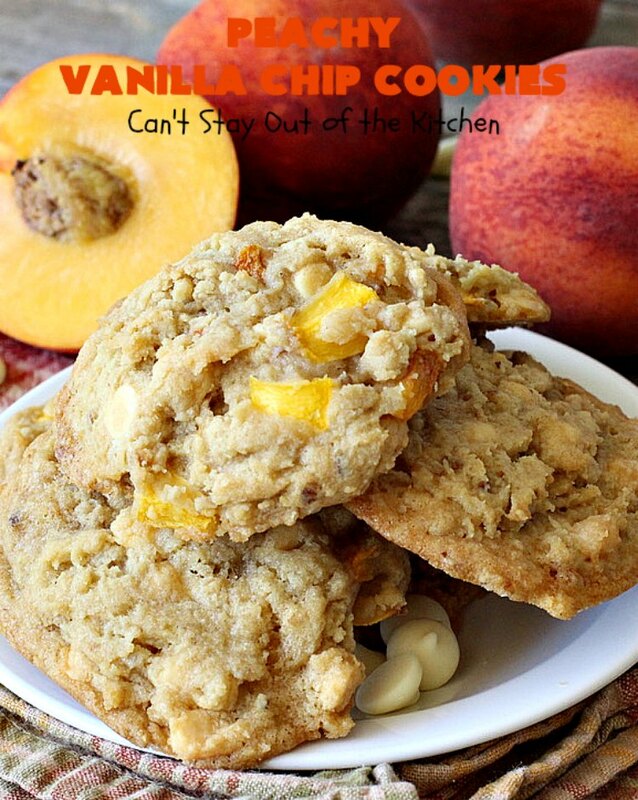 Add the decadent flavor of vanilla chips to peaches and the flavors just seem to explode in your mouth. Each bite is heavenly. 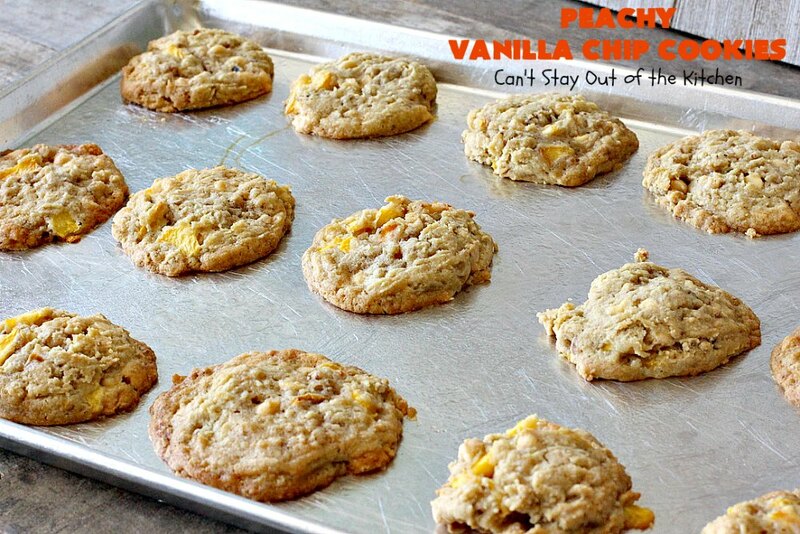 For those of you with a sweet tooth who love peach desserts, then I highly recommend Peachy Vanilla Chip Cookies. 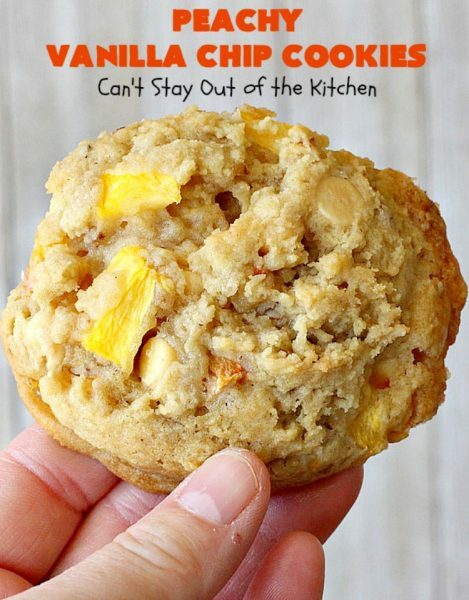 These cookies aren’t difficult to make. Paring and dicing the peaches is what takes the most time. 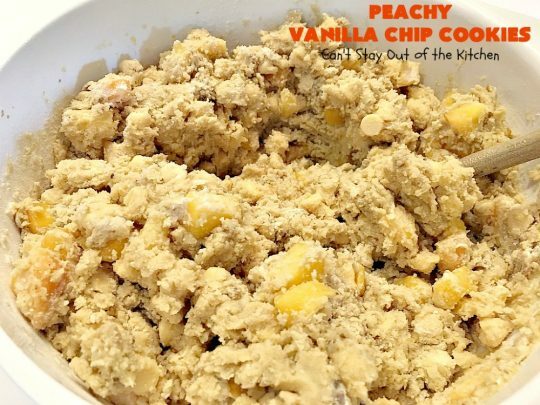 But now that peaches are in season (and soon to be out of season), this is the time to bake up all those peach desserts you’ve been wanting to make lately. 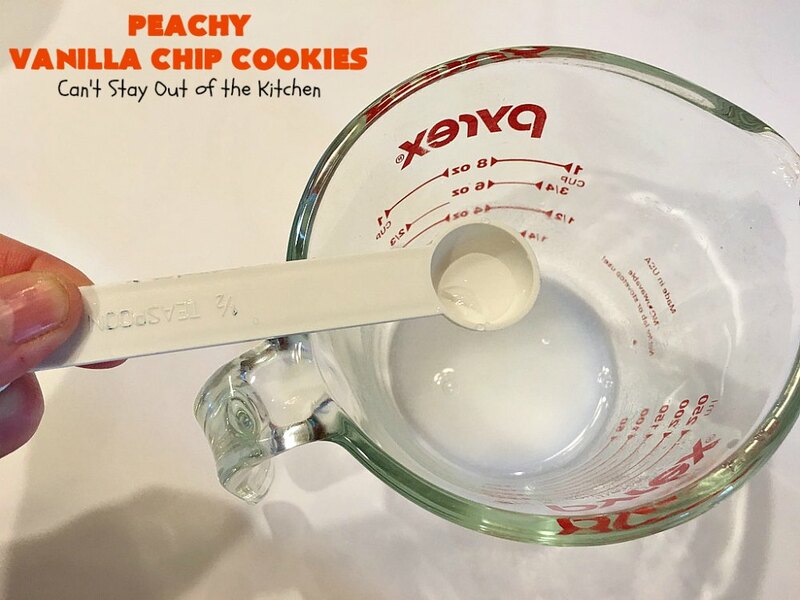 Give Peachy Vanilla Chip Cookies a try and see how quickly your family keeps coming back for more. I initially posted this recipe in September 2014. I recently remade the cookies to bring along to our church’s annual Kid’s Fest. It’s a festival where we invite the community to all kinds of games, bounce houses, water slides and food for families in the community. I made a batch of these cookies along with about six batches of my Chocolate Chip Cookies and several batches of Three-Ingredient Peanut Butter Cookies. All the cookies were very well received and enjoyed. 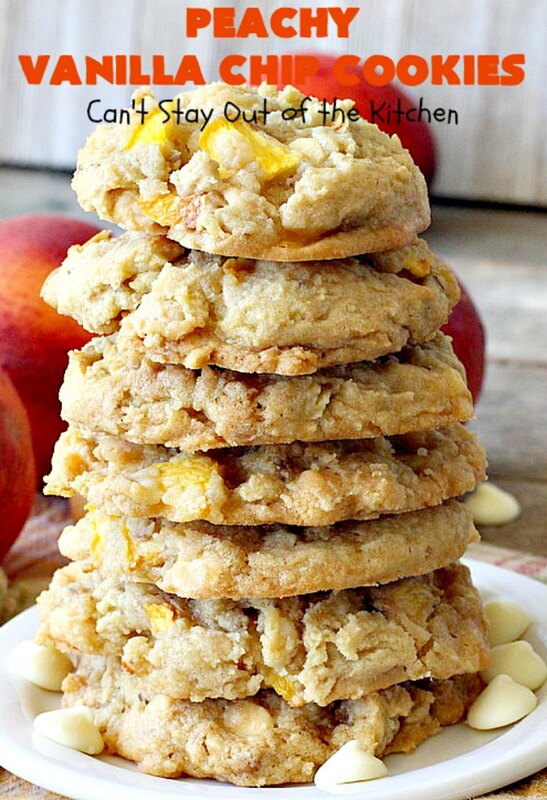 Peachy Vanilla Chip Cookies are rich and decadent. 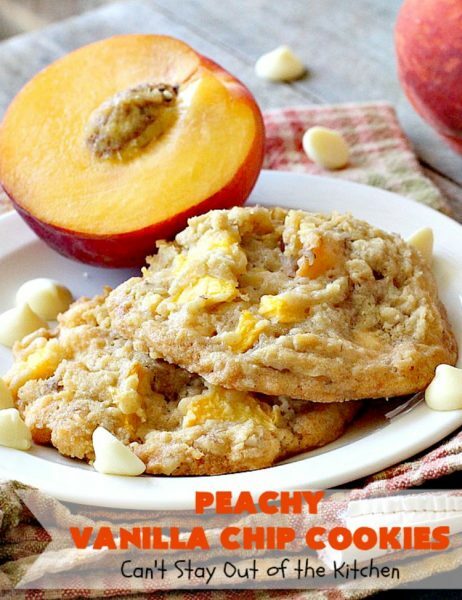 Peachy Vanilla Chip Cookies are sure to satisfy any sweet tooth craving you have. I love the combination of peaches, vanilla chips and walnuts in these cookies. They have a nice crunch as well as being chewy. Measure baking soda and add to hot water. The mixture will fizz. Set aside as the baking soda activates from the heat. 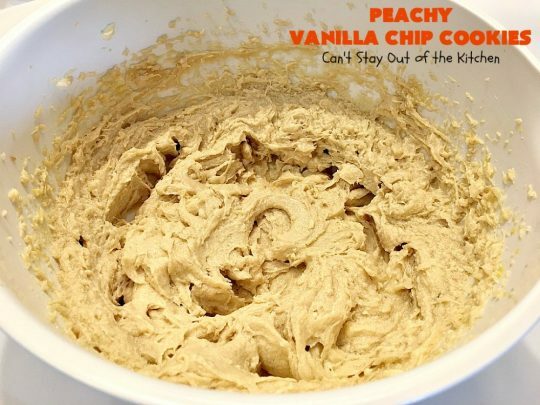 In a large mixing bowl, place softened butter, sugar, brown sugar, eggs, salt and vanilla. Add UNBLEACHED all-purpose flour. Bleached flour toughens baked goods. 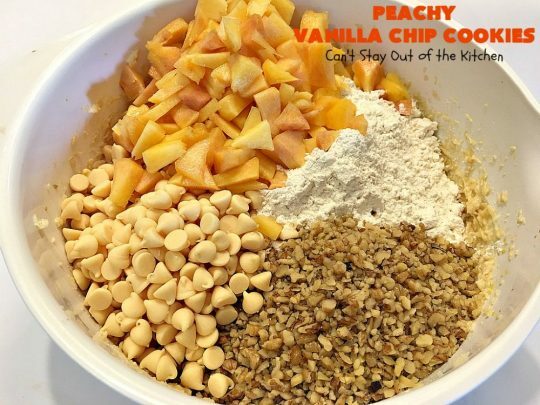 Add walnuts, finely diced peaches and vanilla chips. Spray cookie sheets with cooking spray. 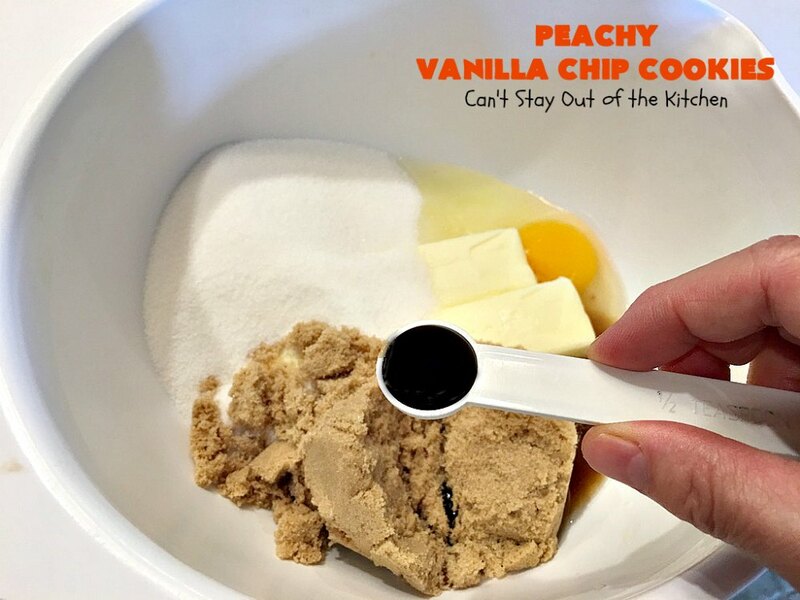 Using a 1/4 cup ice cream scoop, scoop dough onto prepared baking sheets. Bake at 350 for about 15-20 minutes or until done. These whoppers took more time than smaller cookies. 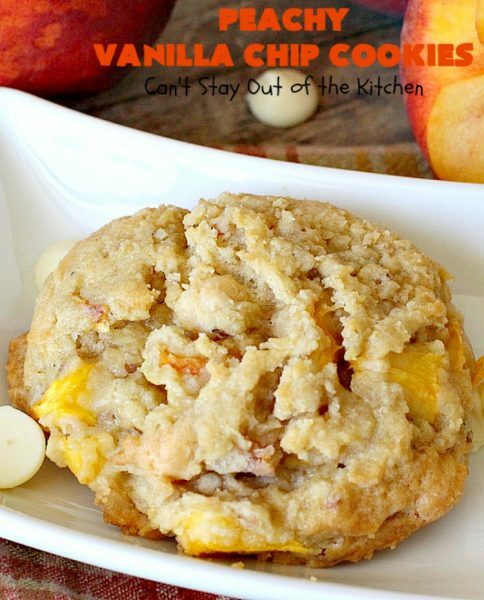 Peachy Vanilla Chip Cookies make a great snack for tailgating parties. These cookies are also great for summer and fall holidays, barbecues and potlucks. 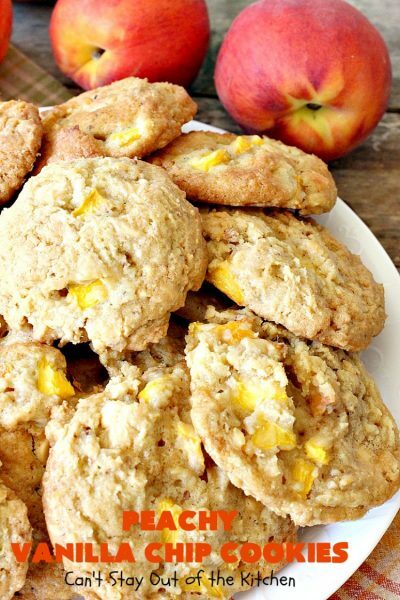 If you enjoy peaches, you’ll love these cookies. Rich and sweet, Peachy Vanilla Chip Cookies are great for summer and fall holiday get togethers, potlucks and barbecues. 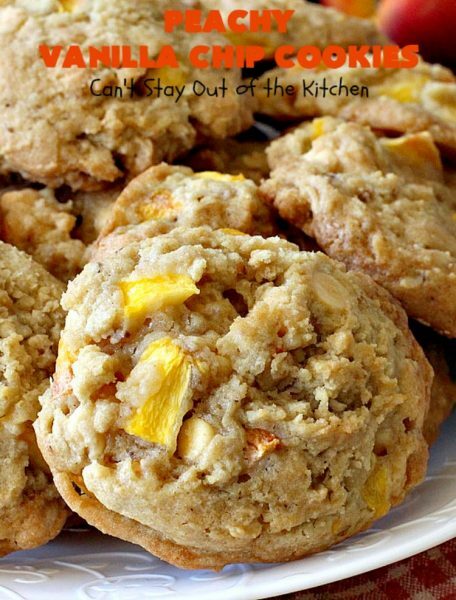 These cookies are filled with fresh peaches, vanilla chips and walnuts providing a tasty crunchy and chewy texture. Stir in flour, vanilla chips, walnuts and peaches with a wooden spoon until well combined. With a ¼ cup cookie scoop, scoop dough and place on cookie sheets that have been sprayed with cooking spray. NOTE: These whopper sized cookies take longer to bake than regular sized cookies. 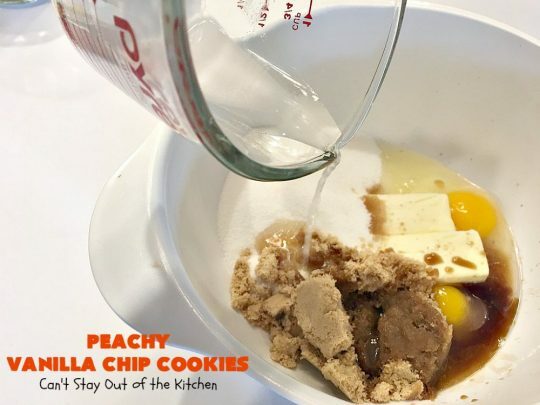 These whopper sized cookies take longer to bake than regular sized cookies. Peachy Vanilla Chip Cookies are so good you’ll be hard pressed to stop at just one. 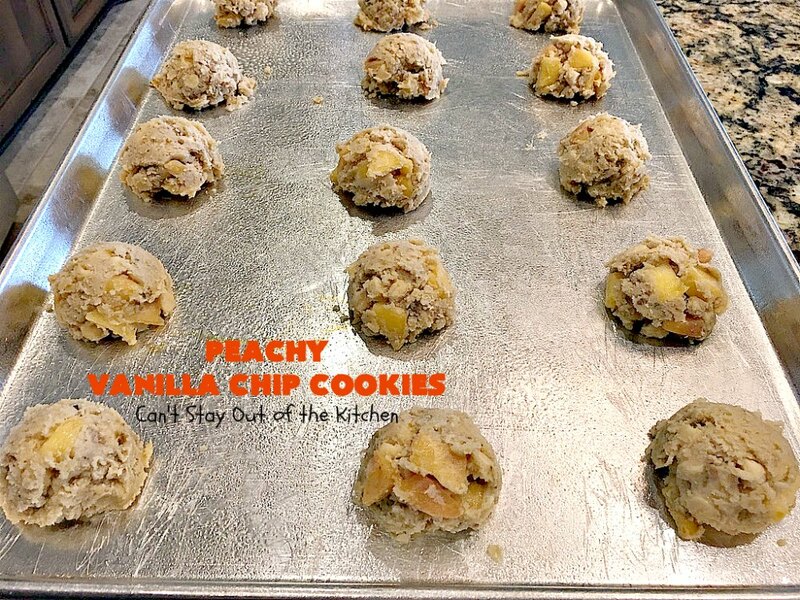 Give Peachy Vanilla Chip Cookies a try while peaches are still in season. You won’t be disappointed. Oh, make me some! They look marvelous, Teresa. 🙂 Thanks, Tamara. I think they’re richer than when using chocolate chips!